This website contains a BBC Science and Nature program featuring black smokers. The site gives a brief overview of the program which focuses on black smokers and the attempts of one team of scientists, led by Professor John Delaney from the University of Washington in Seattle, to raise a group of the giant chimneys, intact, from the seabed to the surface to study on land. A link to the full program transcript can be found at the end of the program overview. 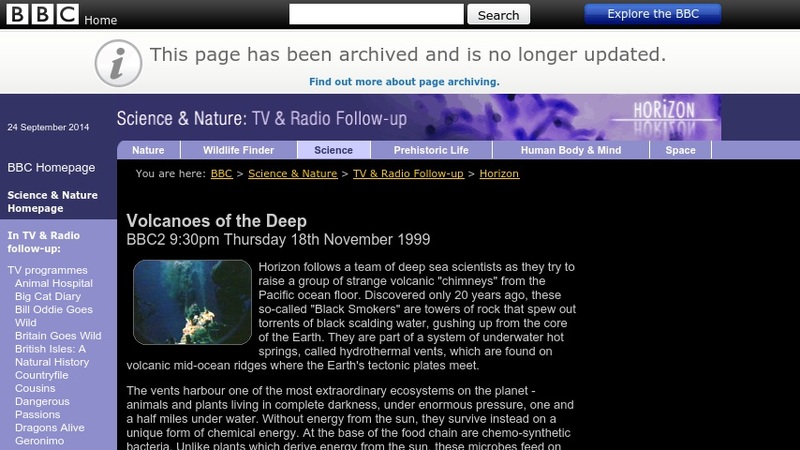 The site also contains links to the BBC home page and other BBC Science and Nature programs.